We enjoyed being two days of zine fun so much last year, we’re doing it again this year! Friday Sept. 29th: Programming, 11 am- 5:30 pm, for tablers and the public at Richmond Public Library in the Basement Annex. Applications for tabling will open July 1st. This year the tabler notification and payment process will be handled differently. It will no longer be on a first-come-first-served basis. On August 1st, tablers will start receiving acceptance emails. Applicants must pay within 10 days of notification. If we hear nothing from you or don’t receive payment, we will notify someone else on the waitlist and you will go to the bottom of the queue. 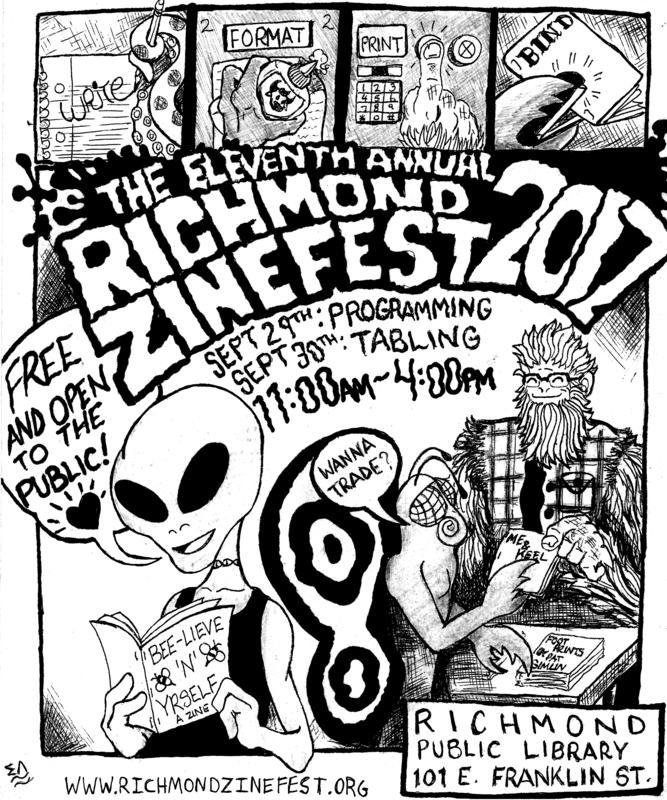 If you have any questions email us at zine.fest@richmondzinefest.org. Previous Post Year 10, Baby!